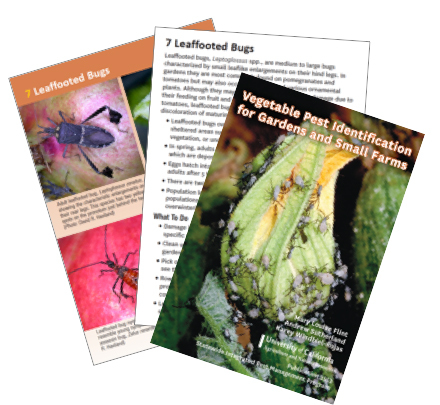 This handy, pocket-sized guide helps farmers and gardeners identify and manage vegetable, fruit tree, and melon pests in smaller operations such as backyards, community or school gardens, or small, diversified farms in urban and rural areas. The cards focus on sustainable management methods that prevent pest problems while protecting people and the environment. Suggested techniques emphasize using less pesticide or are generally considered organically acceptable. Designed to be a convenient reference for use outdoors, the photographic cards help users quickly identify pests and provide concise, bulleted information on biology and management. This set of 53 laminated 3.5” x 5” cards is also spiral-bound for easy use. Topics covered include biological control agents, insects and other arthropod pests, snails and slugs, plant diseases, nematodes, abiotic disorders, and short sections on weeds and vertebrate pests. Forty common invertebrate and plant pathogen pests are also represented with color photographs and a page of identification, biology and management tips. Over 110 specific disorders and pest species and 20 beneficial natural enemies are pictured. Includes references to relevant UC IPM Pest Notes and other printed and online publications available on the UC IPM and UC ANR Catalog websites. Accessibility /IPMPROJECT/vegetablesidcards.html revised: August 6, 2018. Contact webmaster.